A fake livestream on Facebook purporting to show ‘the face’ of Tropical Storm Irma amassed over 5.8 million views in under four hours. The footage was, in fact, a looped GIF of a video that emerged in 2011, but was broadcast by EBUZZ on the social media site as a livestream. The original video was posted on YouTube by Denis Farmer six years ago before a storm in Grand Falls, New Brunswick, Canada. 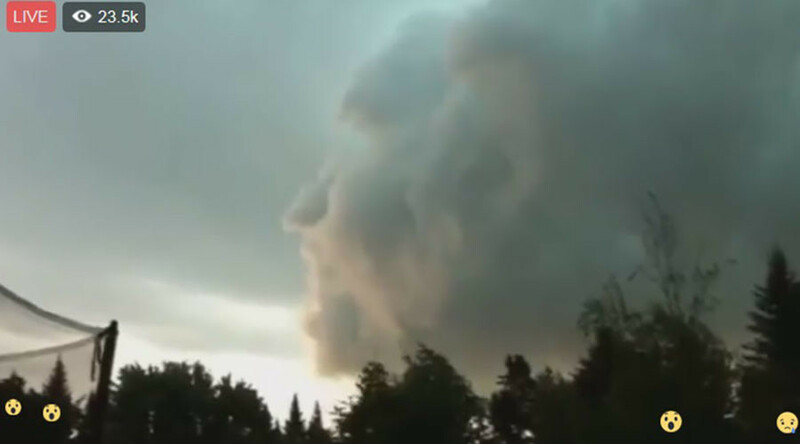 The ‘face’ in the cloud appears after more than a minute of the almost-three-minute-long video. The clip went viral at the time, gaining media coverage from several outlets including the Weather Channel, CBC News and the Huffington Post. Farmer was described as an ‘amatuer cameraman’ by media. In the four hours it was live, the EBUZZ stream accumulated more than 5.8 million views, 167,800 shares and 81,000 interactions. However, others took the scene at face value. “Well it is fb live so it would have to be current,” one person wrote. “This gave me goosebumps all over. Looks like the DEVIL,” another said. RT has contacted Facebook for comment on the broadcast. No contact details are listed for EBUZZ on its website or social media accounts.